Imagine the scene: Barack, BlackBerry in hand, nervously scuttles over to the secret service to make his plea. "Please sir, I want an iPhone," he says. All he gets in response is a sunglass-covered stare that means "absolutely not," and the leader of the free world is sent dashing back to the Oval Office, a tear in his eye and disappointment in his palm. It looks like even the President of the United States is falling out of love with BlackBerry, after Barack Obama revealed that he wasn't allowed one of Apple's shiny iPhones. 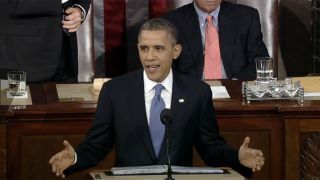 During a speech at the White House, Obama mentioned that he's "not allowed, for security reasons, to have an iPhone." Back in 2008 he was branded "cool" because he used as BlackBerry. How the times have changed. He is, however, allowed both an iPad and a MacBook, so it's not all deprivation. While you let the fact that you've probably got a better phone than the president of the United States sink in, take a look at some more awesome blips.